A carte de visite by A.J. 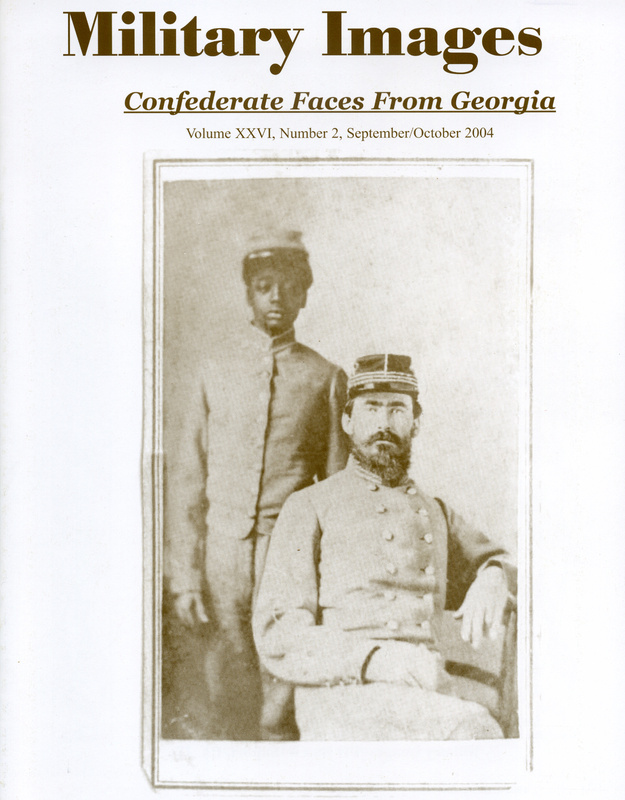 Riddle of Macon, Ga., pictures an unidentified Confederate captain and his servant. The image is part of the collection of David W. Vaughan. 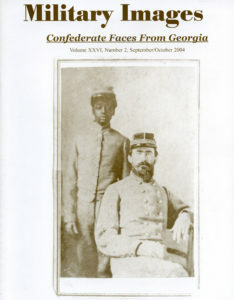 The editor welcomes subscribers to the all-Georgia issue and proclaims this one of the best issues of the magazine ever published. He thanks David W. Vaughan for sharing his prized images. Letters include two modern-day photos of the “rocks” along Theodore Roosevelt Island across from Georgetown in the District of Columbia. Subscribers sent the images in response to an image in the May/June 2004 issue of the Georgetown Aqueduct. Three books are reviewed and recommended. Journal of War, A Civil War Diary of the Life of William H. Hodgkins, No. 44-Company B, 36th Regiment Massachusetts Volunteers, July 23, 1862 through June 12, 1865 (RDSKS Publishing Company) edited by Robert D. Schoenthal, The Opportunity Is At hand: Oneida County, New York, Colored Soldiers in the Civil War (Schroeder Publications) by Donald Wisnoski and Fort Sam, The Story of Fort Sam Houston, Texas (Maverick Publishing Co.) by Eldon Cagle Jr.
A brief history of Georgia’s military contributions to the Confederacy and a Q&A with Atlanta, Ga., collector David W. Vaughan marks the beginning of a multi-page presentation featuring images from Vaughan’s impressive collection. Four men are pictured: Maj. Gen. Howell Cobb, Brig. Gen. Hugh Weeden Mercer, Brig. Gen. Edward L. Thomas and Brig. Gen. Edward Dorr Tracy. A total of 6 portraits include Pvt. George M. Harper of Cutts Battery, 11th Battalion Artillery, also known as the Sumter Flying Artillery, Pvt. Lafayette W. DeTaum of the 9th Battalion Artillery, an unidentified member of the Washington Artillery, 1st Independent Battalion and four members (pictured in three images) from the Troup Artillery: 1st Sgt. George Newton and Pvt. Albert S. Dorsey, Capt. Alexander F. Pope and Maj. Marcellus Stanley. Five portraits include Corp. William O. Perry of the Coweta Rangers, Cavalry Battalion Phillips Legion, Lt. Col. William Gaston Delony, Cavalry Battalion, Cobb’s Legion, Pvt. Thomas Byrd of the 1st Cavalry, Surg. Joseph Barnett Carlton of the 2nd Battalion State Troops and the 3rd Cavalry State Guards and Pvt. Thomas Tate of the 4th Cavalry. The following named soldiers are included in this group of 36 images: 2nd Lt. John L. Ells of the 3rd Infantry, Pvt. David E. Cessar of the 1st Infantry, Pvt. Ashford M. James of the 4th Battalion Infantry, Pvt. Melanathan H. Cutter of the 2nd Battalion Infantry, Pvt. James D. Means of the 5th Infantry Reserves, Lt. Col. William Lewis Salisbury of the 5th Infantry State Guard, Capt. James Allums of the 5th Infantry State Guard, Maj. Philemon Tracy of the 6th Infantry, 2nd Lt. Lawrence C. Berrien of the 1st, 8th and 9th infantries, 1st Corp. William G.G. Raines of the 9th Infantry, Pvt. Thomas G. Wood of the 11th Infantry, Pvt. William D. Purcell of the 9th Battalion and 37th infantries, 2nd Lt. Culver of the 15th Infantry, Sgt. William D. McMickle of the 21st Infantry, Pvt. Ezekial Taylor Bray of the 16th Infantry, Pvt. Curtis Greene of the 21st Infantry, Pvt. Harry Cook of the 23rd Battalion Local Defense Troops, Pvt. Bryant G. Phillips of the 6th State Troops and 32nd Infantry, Pvt. Charles Marion McClain of the 24th Infantry, the Fincher brothers of the 43rd Infantry, Pvt. John L.T. Sawyer of the 45th Infantry, Pvt. William Polk Davis of the 49th Infantry, 5th Sgt. D.T. Carmical of the 4th State Troops and 53rd Infantry, 2nd Lt. George Washington Wood of the 60th Infantry, Capt. Moses Liddel Brown of the 7th and 66th infantries, Asst. QM Cecil C. Hammock of the 66th Infantry, Pvt. Strickland of an unknown regiment, four unidentified infantryman and five men from the 4th Infantry: Lt. Col. David R.E. Winn, Capt. Youel G. Rust, 1st Lt. William C. Wimberly, Pvt. James J. McKinley and Pvt. James Ansley. Four portraits, two sixth-plate ambrotypes and two sixth-plate tintypes of soldiers brandishing edged weapons. Three groupings of portraits, all unidentified soldiers, are included here. “High Fashion” features three images, “Georgia Drummer Boy” is a single portrait found in a Macon, Ga., estate, and “Georgia Cartes de Visite” feature three portraits with Atlanta and Columbus, Ga., back marks. Five views of the stockade, a burial and graves at Andersonville and four views of the defenses and damage at Atlanta are featured here. Details of the carte de visite by A.J. Riddle of Macon, Ga., note that this is only one of six known images of a slave dressed in a Confederate uniform. In Part One, the author provides a history of the Georgia Military Institute, or G.M.I., illustrated with a period oil painting of the campus and a carte de visite of Cadet Lt. Thomas H. Bomar. In Part Two, he examines the cadet uniform that was closely patterned after that worn by cadets at the U.S. Military Academy, illustrated with images of a the only surviving jacket, which is owned by the Alexander H. Stephens State Historic Park near Washington, Ga. The story concludes with five portraits of unidentified G.M.I. cadets. Subtitled “A Georgia lad and his sister experience the war years,” the author describes a recently discovered collection of four ambrotypes, three of a young girl and another of a young man. What follows is an account of Jesse’s military service based upon incomplete and contradictory military service records that ends with his wounding during the Battle of the Wilderness and a likely conclusion that he did not survive the war. An unusual carte de visite of Hernandez (1821-1903) clad in what appears to be an ornate smoking jacket and cap illustrated the story of his life from his early days in Florida to his wounding and capture on the Atlanta on June 17, 1863. Captured when the Atlanta fell into enemy hands, Hernandez eventually returned to the navy and served out the rest of the war. The author tells the story of Hatchett, including his participation in the Battle of Gettysburg and wounding during the fighting at Houck’s Ridge on the afternoon of July 2, 1863. Hatchett survived the war and lived until age 92. The text is illustrated with an ambrotype from the author’s collection. Three images are featured, including Pvt. Joseph P. McCann of the 9th Infantry, a man in civilian attire posed with a double-barrel shotgun and a D-Guard Bowie knife, and a half-plate ambrotype of a soldier who may have been a member of the 1st Infantry. A sixth-plate tintype from the David W. Vaughan collection is a scene of Dug Gap, Ga.